The bride wanted teal and peach - so I incorporated the color teal in with colored Bullion wire. Although I could use a flower tint to tint some type of fresh white flower, I prefer leaving the flowers in their natural colors. 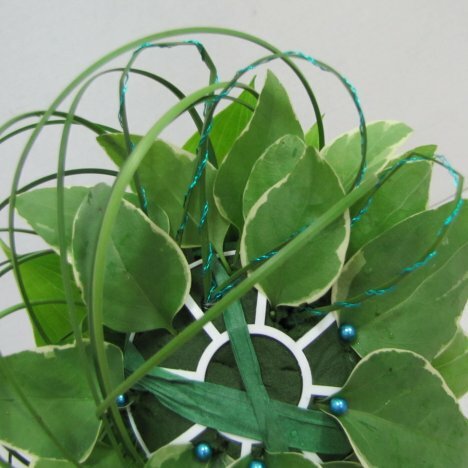 You can see I added teal to the bride's bouquet with the bullion wire and spray rhinestones. I left the rhinestones out of this one, since I wanted the bride's bouquet to have more sparkle and attention than the attendant's bouquet. I inserted the first spray rose head pointing upwards. 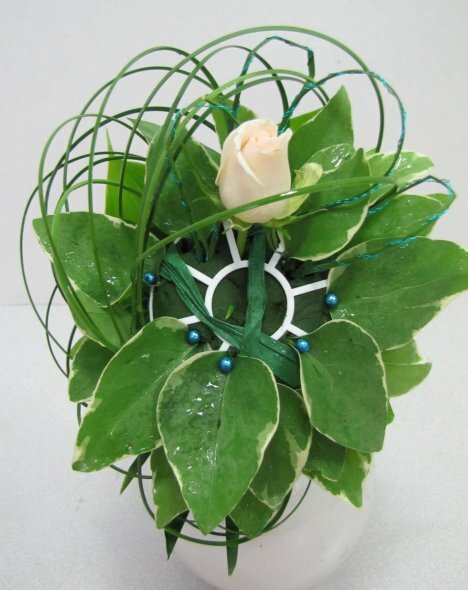 Take care to point your flower heads in a way the they are straight out in the center, begin to face outwards until the flowers on the outer rim are pointing out to the sides. 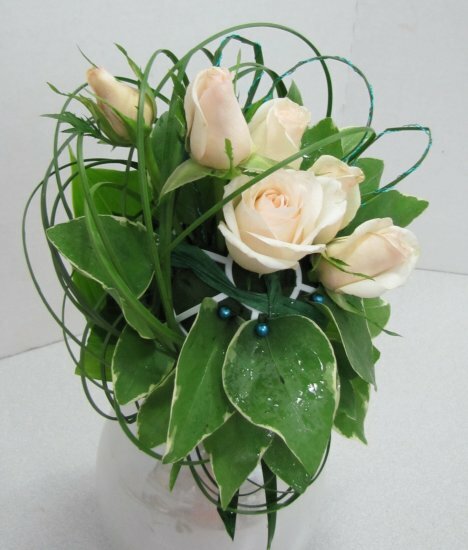 This gives the bouquet more depth and a nice view of flower heads when viewed from the sides. I put a more open rose in the center and tighter roses on the sides. 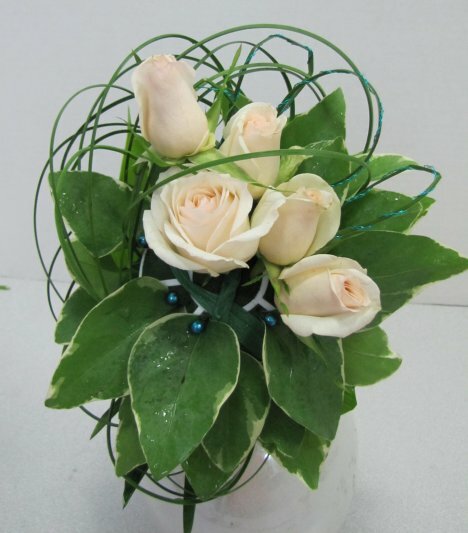 Spray roses will continue to open if the bouquet holder is kept completely saturated. 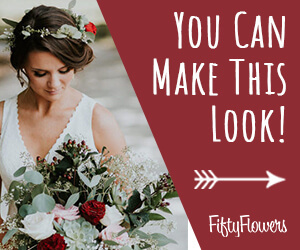 Don't forget to re-water your bouquets all the way up to the wedding day. You can see from the sides what a lovely balance you have of both texture and color in the bouquet. 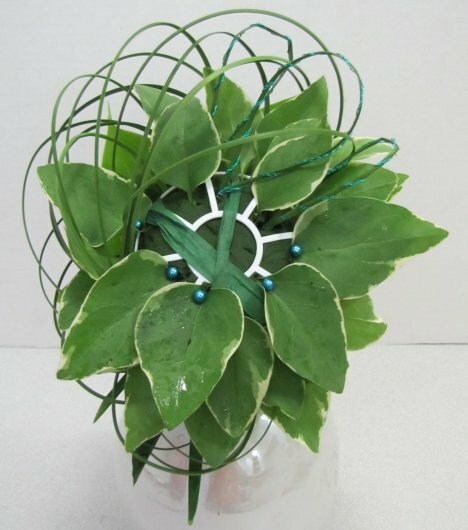 Monochromatic bouquets (all the same color) need to have lots of interest to keep them from being boring.